Does Elon Musk's space exploration ambitions know no bounds? The head of the SpaceX private space flight company took to the stage today at the International Astronautical Congress in Adelaide Australia to reveal his latest plans for sending man to Mars – a new spacecraft called the BFR. What's BFR stand for? Quite literally, "Big F*cking Rocket". And the Tesla founder isn't kidding. The 106 metre-tall rocket could carry payloads 9 metres in diameter, potentially making it a one-stop solution for not only transporting passengers, but large cargo including satellites too. As with much of SpaceX's space ambitions, sustainability is a key element, and the BFR will be designed to be a reusable rocket. Because of that, the lifetime cost of the BFR will be driven down, giving it application that has otherwise eluded historic spacecraft. 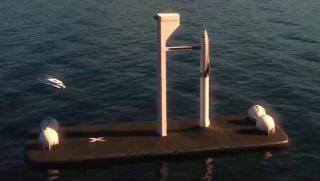 As well as plans to colonise Mars and build a moonbase via travelling with the BFR, Musk envisions the rocket carrying out journeys to destinations on Earth. Passengers could fly to most countries on Earth within 30 minutes, and anywhere on the planet definitively within an hour. Set to "cannibalise" the progress made with previous SpaceX rockets, Musk said the BFR would eventually carry out all the work the others had been designed for. “If we can do that then all the resources that are used for Falcon9, Dragon and Heavy can by applied to this system,” he said. The team aims to have the BFR built and ready for launch within five years, setting itself a 2022 target. If successful, SpaceX aims to send a four-ship mission to Mars in 2024, with each craft holding roughly 100 people in 40 cabins. The aim would then be to build a plant on the surface of Mars that could synthesise fuel to send the BFR back to Earth for further missions.